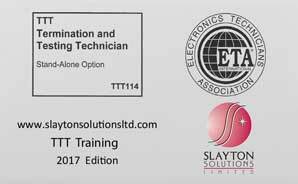 The Termination and Testing Technician (TTT) training and certification is a new vendor-neutral program has been developed to specifically train, test and certify technicians in the proper terminations and testing of Cat5e/6, coax, and multimode fiber. You can view the introduction to the TTT program on youtube by clicking the image above. As our industry continues along the IP path the terminations and testing of new and existing cables take on an increased importance. high bandwidth IP cameras and devices need top-quality terminations and complete cable testing to ensure reliable functionality and the TTT training and certification testing provides the knowledge and skills that are needed for high-quality cabling. 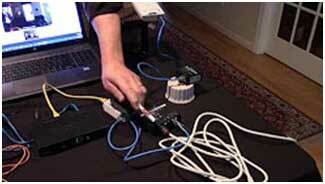 To achieve the TTT certification technicians study the “TTT Video Media Pack” which includes a written manual and lectures and hands-on video demonstrations of the proper techniques to use when terminating and testing multimode fiber, coax, and Cat5e/6 UTP. Those wanting the formal certification can attend a one-day hands-on live training class where they will be taught the proper methods of terminating and testing the various types of cables used in our industry. Once a technician has demonstrated their mastery of the proper connectorization techniques he or she will take a written examination. This class can be presented by Slayton Solutions (slaytonsolutions@sbcglobal.net) at your location if desired. The TTT Media Pack is available at ADI, part #3X-TTTManual.